So the site says, homemade schnapps is quite a hobby in Denmark, and why not. It's easy to make, relatively inexpensive and has that all important "what will this be like?" aspect that so appeals to hobbyists of all kinds. It's exciting to wonder what your concoction will taste like. It's our inquisitiveness that propels us forward. In essence the difference between schnapps and liqueur is the alcohol content, which is the result of the absence of sugar syrup in the case of schnapps. 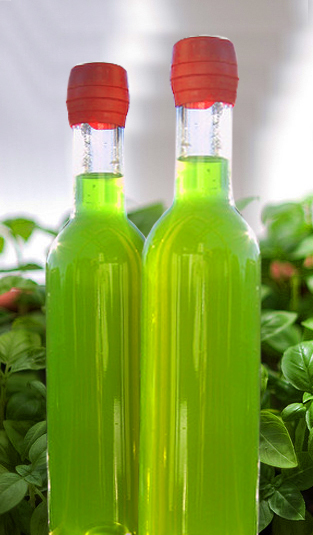 Schnapps is infused liquor, while liqueur is the same, but with a basic 1:1 syrup added. My understanding is that it appears you can make either with nearly any herb, fruit or spice. 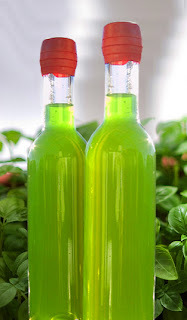 The time it takes to infuse schnapps is usually longer (much longer in some cases) than the infusion time of making liqueur. English oak schnapps ages one year. (Apparently it has whiskey-like flavors…hmmmm.) In the case of the coffee liqueur I posted earlier (which I have independent approval for) it's ready as soon as it's cooled. Interestingly the two recipes I have chosen for posting are the complete opposite, the schnapps taking 1/10th the time of the liqueur. Apparently they're the exception that proves the rule! Basil is easily started indoors. So lets try…basil! Basil schnapps is a popular recipe, and liquore al basilica is a traditional infusion in Italy. 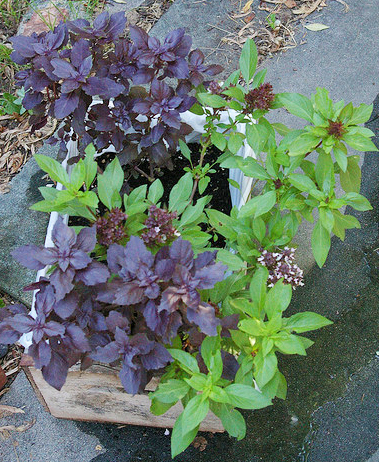 So even if you choose something as commonplace as basil, your choice is quite wide. Each variety will render a slightly different result. I have also discovered that in rendering herbs, using neutral overproof alcohol (80%) gives a more highly colored result more quickly. Sadly, in Nova Scotia we only have access to 40%, so good vodka is our only option. Although our livers are probably glad. Use only fresh basil leaves. Pick them in the morning after the dew has disappeared. That's when they are most aromatic. Don't use dried leaves. Clean the leaves carefully, if necessary. This WILL be necessary if using store purchased, to remove any possible pesticide residue. Handle them with care as they bruise easily. Allow to dry on paper towel. Put the leaves in a jar. Pour vodka over leaves. Add honey if desired. Cover and let steep for 24 hours in a dark place at room temperature (18-20°C, 64-68°F). Shake occasionally. 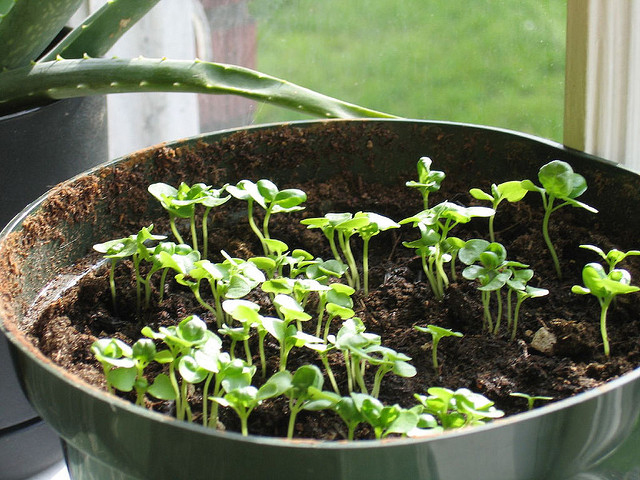 Strain and filter into a clean glass bottle or canning jar. Serve the schnapps straight up or in cocktails after it has sat in the dark for a few days. It will improve with age, but always make sure to store it in the dark. Treat the leaves in the same manner as for the schnapps. Place the leaves and vodka in a jar to infuse for 15-20 days. Gently agitate 2-3 times a day. The liquid will start to change colour immediately. After the initial infusion, strain the leaves out of the alcohol. heat the sugar and water just to boiling. Remove from the heat and allow to cool slightly. 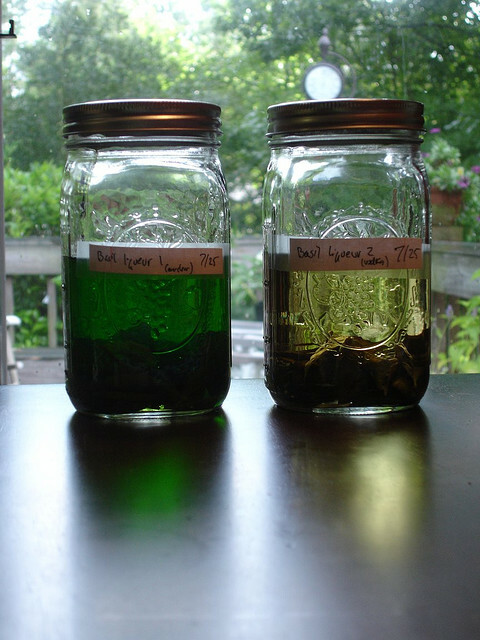 Combine the infused vodka and sugar syrup in a clean jar and allow to age in a dark place for another 15-20 days. Serve as cold as possible. The best way is to chill down in the freezer compartment of your refrigerator. Just be certain that it doesn't begin to become slushy.